Germany’s largest power producer, RWE, has struck a deal with local solar developer Conergy to lease rooftop solar systems. The deal is designed to encourage commercial customers to install the technology on factories and offices, thus lowering their operating costs. Under the partnership, RWE will market solar systems with a peak output of between 50 kilowatts and 200 kilowatts to existing and new customers, while Conergy will design the arrays, supply components, and offer operations and maintenance services. No financial details have been disclosed. The deal comes as RWE -- which has traditionally relied on its coal-fired and nuclear power production business -- sheds its old business model in favor of becoming Germany’s “holistic energy manager of the future," and more specifically, begins to position itself as a key enabler in the fast-growing European renewable energy sector. “The guiding principle is ‘from volume to value,’ with technologies ranging from large-scale offshore wind and hydro to onshore wind or photovoltaic,” the company said in a strategy paper last October. 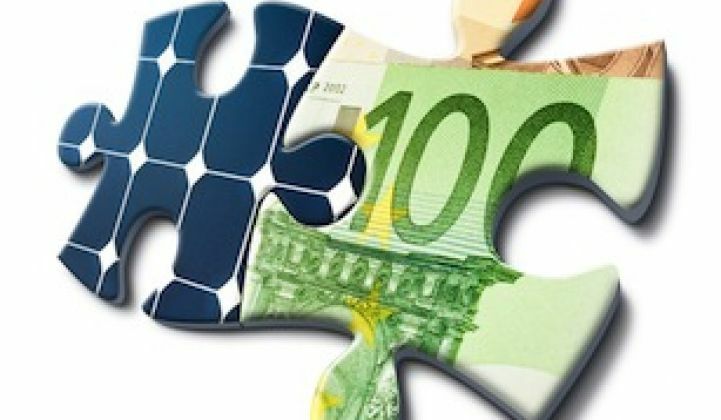 Solar leasing -- a small-scale PV financing model that has taken off in the U.S. and looks to be emerging now in Australia -- has yet to take off in Europe, but could be a perfect fit with RWE’s new business strategy. Conergy, for its part, appears to be well equipped to meet its end of the bargain after this week landing a $60 million bank guarantee to finance its growing project business. Bloomberg reported on Tuesday that the facility was arranged by Deutsche Bank and financed by Tennenbaum Capital Partners. Editor's note: This article is reposted from RenewEconomy. Author credit goes to Sophie Vorrath.